A line of riot police with shields and clubs stands ready to suppress any violence from the Rak Chiang Mai 51 demonstrators. Armed Rak Chiang Mai 51 red shirts took to the streets again last Thursday evening after hearing via their community radio station that two government ministers were due to land at Chiang Mai International Airport, (CNX). Police from Phu Ping station, already at CNX as the ministers’ plane had landed some time before the rioters arrived, arrested one of the mob’s leaders, Niyom Leaungchareon, after finding a loaded revolver and two walkie-talkies in his truck. Immediately, the arrested man’s wife put out a call via the radio station for reinforcements to assemble in front of Phu Ping police station, where her husband had been taken for questioning. By 8 p.m. on Thursday evening, a large group of protestors had arrived, and a representative had been sent to demand that Niyom be released without charge. The demand was refused because of the nature of Niyom’s crime. During the riot, the mob damaged several police pick-up trucks. Shortly afterwards, police armed with shields and clubs attempted to disperse the mob, who had called for back-up from outside the city. By 9.30 p.m., the rioters had regrouped at two points in the city; in front of Rajamangala University of Technology, 100 metres from the police station, and at the entrance to the Warorot Grand Palace Hotel, owned by another of their leaders. The intention was to unite the two groups and storm the police station. Tension increased with the arrival of 500 police officers; by 10 p.m. shots were heard and the rioters began throwing rocks and home-made bombs at police, resulting in injuries to both sides. The confrontation lasted for half an hour, quietening after a red shirt leader, Tanin Praditpan, asked the rioters to desist. Two guards from the mob were arrested, but the protestors refused to disperse. Finally, at 1 pm. on Friday morning, a decision was made to break up the rally with the use of water cannon mounted on fire trucks. 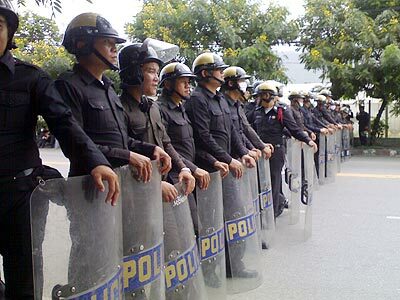 600 riot police were employed to drive the mob back as far as the Chiang Mai University gates. Shots were heard again; a number of plain clothes and riot police approached a small group of red shirts, resulting in a home-made bomb being thrown, injuring a woman at a nearby bus stop. 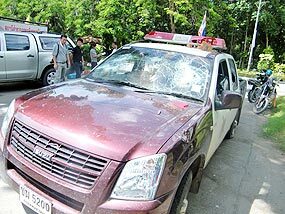 Later, Prime Minister Abhisit Vejjajiva warned that such incidents could seriously damage Thailand’s already badly-wounded tourist industry, adding that the protest was not freedom of expression of political opinion as commonly understood and permitted under the democratic system, as the armed demonstrators had attacked and injured a number of police officers. Abhisit thanked the police for keeping the situation under control and maintaining order. July 13 was a day of celebration for Chiang Mai – the day that Noppawan Lertcheewakarn, (Nok), the amazing 17 year-old local girl who won the junior titles at Wimbledon in both the singles and doubles, arrived back from her triumph to her home town as the number 1 ranking junior circuit female player! Nong Nok, the new Wimbledon Junior Champion, pictured cuddling the baby panda during her visit to the zoo. Sophon Dumnui, right, director of the Zoological Park Organisation of Thailand at Chiang Mai Zoo, is looking on. The pride her city felt in her achievement was expressed with exuberance by a large crowd of Chiang Mai residents, backed up by the College of Performing Arts’ Sabudchai Drum group, happily giving it their all. VIP’s lined up in welcome, including Chumporn Saengmanee, Chiang Mai’s deputy governor, Udonpan Jantarawiroj, president of the Sports Association of Chiang Mai, Surawut Saetiew, director of the Parent/Teacher Association of Regina Coeli College and Rujira Premanont, director of the Sports Authority of Thailand’s Chiang Mai office. But, for the young tennis star, perhaps the most important people there were her grandmothers…her father having travelled with her to the tournament. Obviously overjoyed, Nok expressed her happiness to be home again, adding that her ambition during the next year was to be in the top 200 world-ranking players in professional tennis. She hopes to reach the top 20 within 3-4 years – her position now is number 396 – a tremendous challenge, in which everyone wishes her success. And In 2010, she plans to compete in 15 professional tournaments, and will only play junior tennis in grand slam tournaments. The good news is that she will get all the help she needs, as, from September this year, PTT Public Co.Ltd in coordination with the South East Asian Tennis Federation are bringing in the world-class tennis coach, Chuck Kriese, who will, hopefully, work with Nok for the next 3 years. A personal trainer will also be hired, to ensure that the talented teenager builds up her strength and health to the high level required by top tennis professionals. On the following day, July 14, another welcoming ceremony was arranged for Nok, this time at the Chiang Mai Night Safari, at which she was appointed as the facility’s Ambassador for the Preservation of Forests and Wild Animals, in the hope that youngsters, especially, who see the new tennis star as a role model will learn from her example and increase their awareness of the need for conservation of the natural environment. Present at the ceremony were Chumporn Saengmanee, Chiang Mai’s deputy governor, Narong Tananuwat, MD of the Night Safari, his board of directors and staff, the vice president of the Chiang Mai Chamber of Commerce and representatives from the Chiang Mai Provincial Agricultural Office, all of whom congratulated Nok and welcomed her home, presenting her with longan fruit and a privilege card. Perhaps the parts of her visit that Nok enjoyed the most, however, were meeting with one of the Night Safari’s elephants, who greeted her as she arrived, and her visit to panda mum Lin Hui’s new and as yet unnamed cub, who enjoyed a cuddle with Chiang Mai’s famous ‘daughter’. 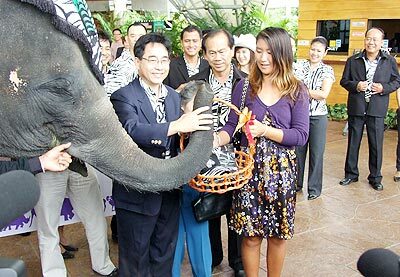 Nok, Chiang Mai’s very own and very cute tennis star, pictured being welcomed by the Chiang Mai Night Safari’s also very cute elephant, Naamwan. 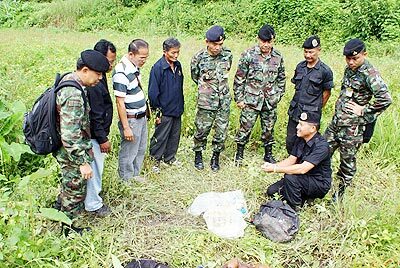 At the scene of the gunfight during which 2 ethnic Wa drug runners died, soldiers from the Phra Muang task force stationed near the Burmese /Thai border are pictured after the discovery of a bag containing 50,000 methamphetamine tablets. The gang of smugglers had been attempting to deliver the drugs to dealers in Fang district. A report issued by local Tachilek police has confirmed the seizure of 1,000 kilogrammes of heroin and 340,000 YaBa pills at a checkpoint on the Tachilek side of the Thai/Burmese border, following the stop and search of a truck carrying the illegal drugs. Police also confirmed that the haul, the largest this year, was destined for Thailand. The suspect truck had been travelling from eastern Shan State, the home of the United Wa State Army, known to still be active in the trading and transportation of illegal drugs across the border into Thailand. The driver of the truck and his two passengers were arrested and held for questioning in Tachilek. A recent report from the US State Department notes that Burma remains a main player in the manufacture and supply of narcotics, in spite of reported major destruction of opium fields in the region. An agreement to eliminate drug trafficking is due to be signed by governments in the Greater Mekong region, including Burma, which, according to experts, is second only to Afghanistan in the amount of illegal drugs it produces. Meanwhile, in Chiang Mai province’s Mae Ai district, a report that a shipment of drugs was to be transported across the Thai/Burmese border resulted in a gunfight between soldiers from the Pha Muang task force and the gang of traffickers, two of whom were killed. The remainder of the gang, thought to be ethnic Wa, fled into the forest. Following the gunfight, which began when Thai troops ordered the 6 smugglers to surrender, the area was searched and a bag containing 50,000 methamphetamine tablets was seized. It appears that drugs are buried close to the Thai border, and are transported following orders received from dealers in Fang district. The route, which passes close to Ban San Tondu, is one which is frequently used by drug traffickers, according to Pha Muang task force chief, Maj. Gen.Chawalit Srikit, who added that, ‘if we’re always on alert we locate these smugglers’. 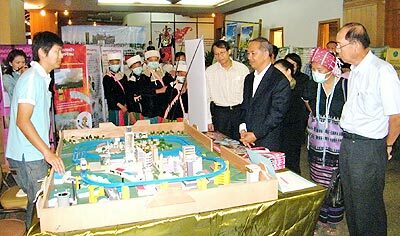 Sutat Pleumpanya, director of the Highland Research and Development Institute and member of the Royal Project Foundation’s secretariat, is pictured examining exhibits at the ‘Green Communities for the Preservation of the Planet’ event, watched by a number of guests including members of the ethnic communities. The 4th Annual ‘Green Communities for the Preservation of the Planet’ event, hosted jointly by the Royal Project Foundation, the Highland Research and Development Institute and the Isuzu Group Foundation, was held July 15 at the Lotus Pang Suan Kaew Hotel. The aim of the event, attended this year by 600 local people and community leaders, is to encourage interaction and the expansion of knowledge between disparate communities in order to increase the potential of environmental problem-solving. By encouraging full community participation, carefully considered plans based on self-sufficiency and care of the local eco-system in each area should become a driving force in environmental preservation. The opening ceremony was presided over by the director of the Highland Research and Development Institute and member of the Royal Project Foundation’s secretariat, Sutat Pleumpanya. In his welcoming speech, he noted that encouraging local communities to be aware of the importance of the natural world also stimulates their awareness of local culture. Guests at the event were able to view exhibitions of work in progress by the Royal Project Foundation, and also enjoyed art and cultural performances given by youngsters from ethnic minority groups. As part of the event, a conference was held, focusing on the need to build strong communities. The overall project itself has been operating in 62 locations across Thailand, 38 of which are Royal Projects, with the remainder awaiting development into Royal Projects. 5 essential steps are undertaken; analysing the communities’ situations, building an improvement plan, initiating the plan, following results while advising the communities and evaluating the end results. The final results are judged on a variety of categories including agriculture, health, the environment, art and culture. During the 2009 event, 22 community leaders were presented with awards for outstanding success in their projects. A recent seminar held at the Chiang Mai University Convention Centre stressed the importance of both parental and educational guidance in the upbringing of children. Privy Councillor Hon. Prof. Dr. Kasem Wattanachai. 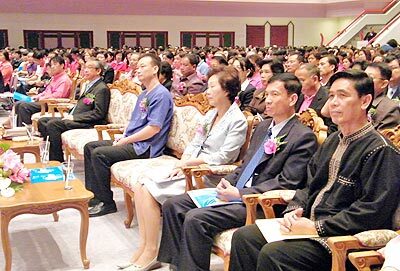 Arranged to stimulate discussion between the various Chiang Mai Parent Teacher Associations and the heads of educational institutions across the board, it was attended by over 5000 local people, including parents, teachers, students and school principals. Guests of honour and speakers included Privy Councillor Honorary Professor Dr. Kasem Wattanachai, and secretary to the Basic Education Committee, Khunying Kasama Varavan na Ayutthaya, and the Chiang Mai governor Amornpan Nimanant. Topics under discussion included the development of good behaviour and morality as well as academic knowledge in students, with Privy Councillor Hon. Prof. Dr. Kasem stating that, although parents traditionally take responsibility for building their children’s value systems, and schools concentrate on education, the two should overlap. Although different schools may focus on developing different personal qualities in their students, an overall focus on values as well as knowledge both at home and at school should result in integrated citizens and a more stable society. Privy Councillor Hon. Prof. Dr. Kasem added that the aim of the seminar had been to raise awareness in parents of the need to focus their efforts on the all-round development of their children, both in their educational and personal lives and experiences. Guests of honour attending the seminar . Chiang Mai’s Christian German School, (CGS), a small international school in Saraphi district which models its curriculum on that of the federal German state of Thuringia, recently held its diploma ceremony for final-year graduating students. The school’s peaceful rural location, surrounded by rice fields, enhanced the happy and relaxed atmosphere of the celebrations, presided over by the Honorary German Consul in Chiang Mai, Hagen Dirksen, who was happy to present the diplomas to the graduates, and to wish them well in the future. During his welcoming address, he presented a document from the German government which confirmed the high standard of education the school provides. In his speech to the students, the chairman of the board of governors stressed that they should help and support each other in the true spirit of friendship. The festivities continued with the school’s rock band and a display of jazz dance by the students. Established in 1994, CGS aims to provide a high-quality and balanced education, presented in the German language, which prepares German-speaking students for re-integration into their home countries of Germany, Austria and Switzerland. Besides emphasizing academic quality, the school encourages honest, open and respectful relationships between the students by means of instruction according to Christian values. In addition, a variety of topics relevant to the Thai context are integrated into the curriculum. Additional German lessons are offered to children with a limited knowledge of the language. The school also teaches the Thai language and culture to enable the pupils to integrate into the host culture. 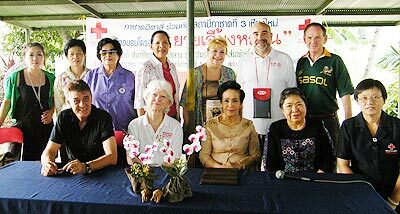 In the front row, (l-r), are Pino Ungaro, head of the Italian Red Cross’s regional delegation for South East Asia, Dr. Maria Letizia Caccamo, Dr.Chao Duangduen na Chiengmai and Somboon Suprasert, Thai Red Cross’s consultant in charge of the project. Second row (2nd from left), is Dr. Francesco Caponi, chairman of the Toscana regional committee of the Italian Red Cross. An educational programme to help HIV/Aids- infected orphans who are being raised by their grandparents after the deaths of their parents was held July 11 by the Chiang Mai chapter of the Thai Red Cross at their Station 3 in Chiang Mai’s Muang district. The programme was developed in order to help guide grandparents in the upbringing of their grandchildren, with a focus on the overall health of both the young and the elderly and the mental health and emotional development of children orphaned by HIV/Aids. Its aim is also to provide a blueprint for life in society for children affected in this manner. Support is being given both intellectually and financially by the Italian Red Cross, who have donated the sum of 37,000 baht to the programme. Its official opening was presided over by the president of the Chiang Mai Cultural Council, Dr. Chao Duangduen na Chiengmai, watched by guests of honour Pino Ungaro, head of the Italian Red Cross’s regional delegation for South East Asia, Dr. Francesco Caponi, chairman of the Toscana regional committee of the Italian Red Cross, Dr. Maria Letizia Caccamo, paediatrician from Italy’s Santa Anna Hospital, and Somboon Suprasert, Chiang Mai Red Cross’s consultant in charge of the project. According to Pino, the Italian Red Cross is involved in a variety of projects worldwide, including a ‘Mother and Child’ project in Vietnam, and also has concerns for women’s rights and HIV/Aids in Asia, Its core beliefs are that people of all genders, religions, and social status deserve equal rights in society. He regards the Chiang Mai project as well-planned and pledged support for its continuance in 2010. The Chiang Mai Public Health Office’s report on HIV/Aids in Chiang Mai since 1997, states there have been approximately 22,547 people infected with the virus, of whom 5,938 have since died. An ethnic project developed by the Chiang Mai University Social Research Institute’s Centre for Ethnic Studies and Development, (CESD) and aimed at Shan immigrants, was the subject of a recent radio programme, hosted by the Migrant Assistance Programme, during which doctors and pharmacists were invited to give advice on health topics. A serial play is also being broadcast, which is being well-received by listeners. At the same time, on July 7, the 2nd annual ‘Health Event for Shan peoples’ was held at Wat Ku Tao and included a performance entitled, ‘To protect is better than to Heal’, focused on helping immigrants to diagnose health problems and protect themselves against disease. The event also included Shan traditional musical performances and stalls selling Shan traditional products. The project itself was developed to aid communications between government and private health organisations and ethnic communities, with ethnic minority workers as the bridge between the groups. Project working stations are located in Fang, Mae Ai, Chaiprakarn, Chiang Dao, San Sai, and Doi Saket. A further working station at Paing Luang is planned. CESD was founded in 1995, stemming from the realisation that ethnic studies in South-East Asian countries and China were important in that they related to other essential issues such as natural resource management and governmental policy. These issues often complicate relations between different ethnic groups, as well as the relations of ethnic groups to the governments themselves. The establishment of the centre’s research and study facilities has aided the building of knowledge bases and public understanding, and has led in turn to suggestions for government policy as well as strategies to solve the problems of ethnicity. 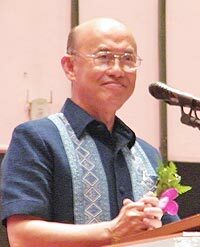 Dr. Kwanchewan Buadaeng, a researcher at CMU’s Social Research Institute, noted that Shan workers in Thailand are the victims of prejudice by the Thais, being perceived as a Burmese minority. Many are illegal immigrants and have problems speaking Thai. As a result, they are often defrauded or mistreated, not paid for their work and physically or sexually assaulted. One of the biggest problems experienced by ethnic minorities is the difficulty of obtaining knowledge in the fields of legal entitlement and health. Ultimately, this situation could result in damage to the host country as a whole. Effective communication on these issues is essential, with the provision of written information alone proving ineffective due to differences in cultural concepts. A trained volunteer force which is able to disseminate verbal information directly to Shan immigrants is the best solution.